Hugh Masekela reflects on his career in performance and interview, from its 50s beginnings through the apartheid years, exile and stardom in America, and return to South Africa. 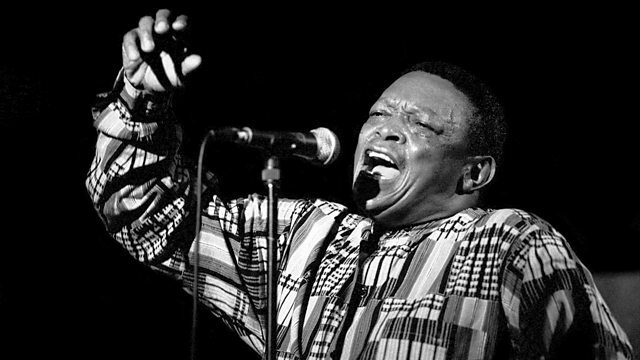 Browse content similar to Hugh Masekela: Welcome to South Africa. Check below for episodes and series from the same categories and more! such a great anthology of songs. a few South African singers, and the community choir of the LSO. I grew up in the...in Africa's largest coal-mining town, Witbank. Music absorbed me from when I was a little child. who's going to get up first so they can hold it for me? Cos I wasn't strong enough to hold it and wind it up. and I saw a movie about a trumpet player called Young Man With A Horn. I'd already met Father Harrison cos he was chaplain of my school. He asked me one day, "What do you really want to do in life?" I sort of was in trouble a lot with the authorities. I said, "If I could get a trumpet, Father, just a trumpet, I wouldn't bother anybody any more." And he got me a trumpet and a trumpet teacher. which was the only thing that I was lacking. I got it shortly after the Sharpeville Massacre. And...yeah, I left in a hurry. I could already really play, you know? I wanted really to, if nothing else, play in Blakey's Jazz Messengers. But they refused to give me a gig. Everybody said "Why don't you do your own thing? You come from Africa,"
So finally I put together a trio and from there, I was gone. and the Civil Rights thing was on, so it was a great time for anarchy. and Dizzy and... It was all the anti-apartheid people. "They don't even know who you are, nobody knows who you are. "and you're going straight to jail. "nobody will know what happened to you. "and you'll be able to get the message across. "You'll be of more use to your people than going back to them." And...it made sense, so I stayed. I stayed 26 years longer than I had planned. There's a train that comes from Zambia and Zimbabwe. and its surrounding provinces and metropoli. deep, deep down in the belly of the earth. for that shiny, mighty evasive stone. into their iron plates with an iron shovel. from where they last left them. by roving and marauding gangs of no particular origin. with the collaborator, the dog, the tear gas and the poison. With the bomb and the Gatling. And they curse the coal train. I played Monterey Park, you know. Jimi Hendrix was, you know, hanging out there. And we were not wild, but we didn't sleep much. a typical South African dance tune. And Russ Regan was the head of A&R at UNI. he came and said, "I like that album, but you need another sound." I had just brought back from Zambia. He said, "Why don't we try that song? Because it's simple." It's got a bass line with four notes, boom boom, boom boom. The drum just goes bam, ch-ch, bam, ch-ch. it just took us a short time. Maybe we spent two hours on it. And he came in and we played it for him and he said, "This is a smash." This is an old, beautiful song from Brazil. It's called The Joke Of Life. Brinca de Vivre. that injustice was the biggest joke of life. I spent 1980 to 1985 living in Botswana. So, I came back and I lived in England for five years, on and off. On the stage, I toured with Paul Simon and I had Sarafina. were going to be let out of jail and then soon we'll be able to go home. they put him on the phone and he said, "Hugh, you must come home. "It's been long enough now." And the next week I was on the plane. especially the rural, ethnic, indigenous people. about my heritage that I didn't know. to a great extent, the whole continent itself. I knew what the economics of Africa was. I'd lived in Liberia and Senegal. So I knew the terrain. and I need to pay it back. and get them to enjoy their heritage again. and raggedy and very violent past. And also...a very corrupt one. And we've only been free 15 years. maybe for over, like, ten centuries. if not longer, and, like, Germany and all those places. And America has been free, maybe, almost 300 years. But they all have problems. I'll be able to say, "Well, we're making some headway." MUSIC: South African National Anthem - "Nkosi Sikelel' iAfrika"
South African musician Hugh Masekela celebrates his 70th birthday and reflects on his career in performance and interview, from first picking up a trumpet in the 50s through the apartheid years, exile and stardom in America, his return to South Africa on Nelson Mandela's release, and concluding with his vision of the future for his country. The programme also features performances from his 70th birthday concert at the Barbican in London in December 2009, where he was joined by the London Symphony Orchestra, their Community Choir and guest South African singers.